Old photographs have been coming to light while going through boxes packed, repacked and repacked so many times that even the boxed labels are untrue. I actually found a photograph, which I didn't remember, of myself and my youngest brother, on the street in front of our home at that time. My goodness it did bring back memories. My little brother was actually wearing my brown leather tie up shoes which I wore at his age. Those shoes are actually still around and for sale inside the shop! My father, a Canadian Soldier was a Military career man! From his stint in WWII as a young man right into the 1970's working for the Department of Defense. We moved too many times to count anymore and resettling became a problem while growing through the teen years. We never knew which language or which type of school we'd be in next, the world in the 1950's and 1960's was a magical place to get an education. 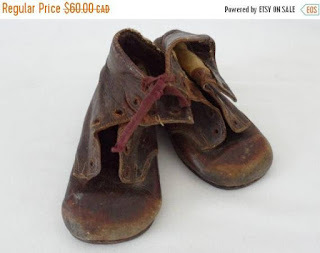 So those little shoes which began their life in Holland as my shoes have seen many a piece of ground as my siblings and I were their masters. My mother was a Dutch Girl and of course the Dutch like every other European lost so much during the war years, these shoes managed to remain as they were on my feet as a toddler and even then if memory serves me correctly these belonged to some other child before these were found by my uncle to send me off to Canada with. Must have cost him a pretty penny, a penny he didn't really have in those days. You've all heard of the Divine Secrets of the Ya-Ya Sisterhood? Well these are the Divine shoes of an Immigrant Toddler! Be kind to Refugees because having survived the German occupation and the devastation of loss it was very difficult for people in Europe to become settlers in a new land and trust that where they were bound for would afford them a much better life than what they were leaving behind. Leaving their families, their friends, they cultures and being frightened of how they'd be accepted upon arrival in a new country and culture was such a challenge. Some never could settle and some settled right into Canadian Life and as many were farmers, they made themselves keepers of land and growers of food which was needed all over the world due to the costs of war. Battling the psychological I think must have been the hardest of hurdles to overcome. Today is no different, refugees are human beings fleeing death and destruction....if you were in their shoes, what would you do if you survived?